Company posts zero lost-time incidents for half-million man-hours worked in 2014. Tampa Tank Inc. – Florida Structural Steel (TTI-FSS) field teams posted an unprecedented record in 2014 for setting outstanding safety standards. While the group logged some half-a-million man-hours throughout its operations in the Bahamas, Caribbean, Central and South America and the United States, it logged only one recordable incident. This team’s Total Recordable Incident Rate (TRIR) was 0.41 for the year. They experienced zero lost-time injuries during the same time period. 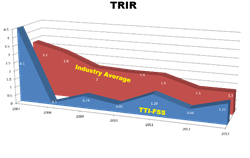 This is the fifth consecutive year the TTI-FSS field safety statistics have improved. Tampa Tank Inc. was founded in 1953 and acquired Florida Structural Steel in 1984. The company provides complete design, shop fabrication, shipment, field erection, inspection and testing of welded steel products for the petroleum, chemical, pulp and paper, mining, electric power, water and wastewater industries. The company operates across North America, Central and South America, West Africa and the Middle East. TTI-FSS is American Society of Mechanical Engineers (ASME) and American Institute of Steel Construction (AISC) certified. For more information, visit http://www.tti-fss.com.